In some circles, gauge charts are a popular visualization tool. They're enticing, seeming to offer up immediate insight at a glance. They allude to the most universal gauge, a car's speedometer. But there are problems with gauges. They're too simplistic. They lack context. They waste space. Sure, we can all imagine what it feels like to be moving 0 mph as compared to 100, but how do we "feel" the significance of $5 million in sales? What's more, with a business's progress being infinitely more complex than measuring the speed of a car, how do we begin to pack layers of information and context into this obstinate circle that's already taking up a large portion of our dashboard? While they can be attention-grabbing, gauge charts can often mislead by omitting key information. Data discovery can be easy, but gauge charts are just too easy—dangerously so. On the bullet graph, you can quickly see that joy is well above quota, laughter is above quota, fun fell short of quota, and bliss is well behind quota. Comparing categories becomes easier, and the graph also saves on space. 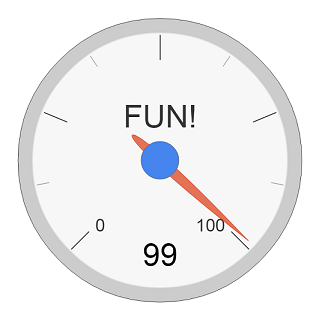 Plus the format is more flexible—what happens if fun exceeds 100 on the gauge to the left? Data visualization researchers prefer bullet charts because they leverage our perceptual and cognitive predispositions. According to statistics professor William S. Cleveland, humans don't compare angles as quickly or accurately as they compare lengths or parallel positions relative to a common baseline [The Elements of Graphing Data, 1985]. Data visualization expert Stephen Few has some great things to say about bullet graphs as well. For these and other reasons, gauge charts aren't included by default in Tableau. Get to know bullet graphs instead. They can do all gauge charts can, and more. Bullet charts may not mirror a ubiquitous symbol, but when it comes to the metrics that drive your business, they pack a lot of horsepower. I won't argue your "simplistic", "context", and "space" comments. However, where you're missing the boat, from my experience, is that most executives prefer to have these kinds of visualizations because of the simplicity. Analysts, researchers, and other data gurus will prefer the bullet graphs. Most executives will not spend time drilling down in the contextual details that you're referencing. It would be so much better if Tableau presented an alternative solution to have these simplistic visualizations instead of forcing companies like ours to go out to buy other tools because you prefer that they adopt bullet graphs. The BI tool should not limit the creativity and ability to communicate with the various audiences it serves. Gauges are important especially in the utilities industry. I believe that most of the conversation is due to the immaturity of the Tableau product and not due to some pedantic discourse on what should or should not be by some BI cop attempting to impose his/her opinions and views on others. Who is the BI cop? Many people tend to believe that is better to have a bad graph but a happy "VP". Teaching and becoming an advocate for good design (and I am not talking about my own perception or that of the so-called "gurus", but hard evidence made by psychological research such as: http://tinyurl.com/m6jnqj3 or http://tinyurl.com/kejf2xg from Stanford) is not an easy task and making people engage in understanding and having a good show also takes some time. In my company we have been able to leave behind the 3D and the gauges in many areas and with many people that benefit from a clean and easy to understand dashboard design. Nice article. However, there is a reason that gauges are used in everything from vehicles to power plants to navy ships and that is they convey key info in a very simple, familiar, and easy to understand form. A perfect example of the KISS principle. I have read Stephen Few's blog, and it is interesting, but at the end of the day he comes across as very academic lacking the pragmatism that comes with real world experience. What about making a more exciting version of the gauge graph? Using colors to divide different regions of the graph. (somewhat like a pie graph). And having the colors some order - like working to red hot. Not convinced the issue of your graph is its being a gauge graph - rather perhaps the issue is that the design doesn't have colors and that it is not very visual it its presentation. My opinion is that you could create a gauge graph that would be more effective than the bullet bar graph if you make your design with purpose and good artistic sense. Excellent point, there are tools out there that will allow you to do just that. I have used these to show yellow, green and red zones (more like a tachometer) indicating under performance, optimal performance and over performance at a glance. Any deviation from green zone and you know action needs to be taken. As some of the other commenters pointed out, most dashboards are not intended to provide granular details about the data. They are intended to provide a quick view and alert users to potential problems without having to sift through details and fine print (space saving bullet graphs with tiny print). The article seems to be a response to requests for gauges which are not currently available. Despite the unavailability of a popular dashboard display, I still give tableau two thumbs up for some of the best data visualization available. Actually the usage of gauges (as airlforida states) is an application of a 3D element used in the "real world" and transported into a bidimensional representation known as Skeumorphism. All gauges (just take a look at a modern cockpit) need additional information that has been replaced/aided with numerical values in order to have an exact idea of what is being reported by the instrument. When using a report, a gauge is OK if it is very easy to understand as Patricia was pointing out, but usually is harder to build a graph based on a real gauge (a good example of a usable gauge is a Red-Yellow-Green one where the information is direct and needs no further interpretation and not to use to compare growth or any other status that could be mistaken or misinterpreted) Also, gauges use more useful space where a bar graph is more efficient and it is possible to convey more information. The question of "what could be better to represent data in a way that makes in understandable to the majority of users" should, in my opinion, be modified to reflect a specific set of data or type of data rather than data in general. In your post, you begin explaining the use of gauges in communicating direct information, and not comparison. I think this is a more focused reflection and getting more to the point of comparing graphs. If one wants to make the argument of what is most understandable for the majority of users - one would really need to examine what type of information the average user needs to convey. Also, I am of the opinion that everyone has experience with simple gauges and their usage is much more broad than for people with specific engineering/machine experience. Also, the three dimensional aspect of a gauge is really due to the nature of stacking physical material - which makes it extremely suitable to digital adaption. And finally - the incredible thing about technology is that time that is spent in intricate design can often be replicated and re-used, thus making complex design available at the fingertips of the average user. If a gauge design can be argued to be effective and that many users would find it helpful for conveying certain types of information, then perhaps having a gauge design could be a valuable proposition. Excellent points Edmundo, especially about skeumorphism. Even in cars, some gauge speedometers (vs. digital display) are just vestigial. Thank you for enriching the discussion! As Edmundo points out with the example above, there are a number of ways to create a gauge chart in Tableau. However, you won't see very many of them being created in Tableau, probably because most Tableau users realize that gauge charts are not best practice and should be avoided. I applaud Tableau for not including them as a default chart type. It's bad enough that pie charts are included. It seems odd though that companies would decide not to purchase Tableau simply because they don't offer a single chart that is considered such bad practices. Addressing some of the comments above, Stephen's writing are certainly based on real-world experience (he consults for companies all over the world) and his work is also founded academic research based on what we know about visual perception and how that applies to data visualization. When it comes to bad practices it seems executives are often the ones thrown under the bus, but I find they are often scapegoats. In my experience, executives simple want the data fast, accurate and easy to understand. I agree that the "performance bands" can be confusing to people who haven't seen it, but you can also make a simple bar chart with a target line and drop the performance bands. I find this is universally understood by everyone and it's a simple click in Tableau to remove the bands. In my mind, the customer is always right. If many customers want gauge charts then let it be so. If some people find them effective for their practice, let them use them. I'm sorry, but presenting philosophical arguments and best practice research really shouldn't be the primary reason why you decide not to offer a certain graph in your software. Provide what the customer wants, not what you think they need. You are providing a service for your customer. Perhaps by providing the gauge graphs, you can bring in customers who want them, and then perhaps they will discover themselves that something is more effective for communicating information. It honestly seems silly to argue to someone that they are fools to use pie graphs and gauge graphs for communicating information. I'm sorry, but that's really not the American way. This is a never-ending debate... to the point that Stephen Few and myself have some bizarre history about this very topic. My initial thought: 1,000,000,000 cars/drivers can't be wrong. If you're driving down the freeway and you see red and blue flashing lights in your rearview mirror, your eyes head to a very basic, very ubiquitous metric -- you know where it is, and you instantly know what it means. Translating to the example in this post: I know right off that my FUN TANK IS ALMOST FULL -- Period! While I can certainly get more detailed info from the bullet chart, I can't draw as nearly as quick a conclusion from it. So, I think this whole discussion gets down the the context of the viz -- if it's a very basic top-level, "a few key numbers to keep an eye on," a few gauges may very well be a better approach. In a more complex dashboard, bullet charts are far better at conveying information that an equivalent number of gauges. I could not agree with you more, Gregory. Just a few, but very important numbers to get the info you need. Gauges have their place on some dashboards. And I agree with your comment about bullet charts being better at conveying more detailed information. I personally use ALEKS for assessing student progress - and I have access to two different dashboards depending upon my needs. For a quick overview, I use the gauges, and for more detailed info, I look at the bullet graphs. Wouldn't want either of them to go away. I would like to see the argument that there is no application of using gauges that is effective. Take for example, the dashboard on a car. How might you suggest the information be displayed that would be better? Just because someone sees that gauges could be valid for some uses doesn't make them more close minded to modern approaches. The whole approach of not providing gauges because it easier for you to reduce the "we've always done it this way" is ridiculous. If you can scientifically demonstrate that gauges are outdated, and have no effective use, let's see it. The notion of not providing gauges because you personally think they are archaic and boring is a bit self-centered. Having options scares you or makes your job easier??? I'm sorry, that's a weak argument. I personally think that drip coffee is disgusting. And in light of my noble intentions to educate you all on the right way to make coffee, I am going to ban the sale of all drip coffee machines in the world. I am doing you a favor by enlightening you to the right way. Don't worry, you'll see I'm right at the end. Love my French Press. Well a good example of understanding how technology and design go forward and how many people react to change was when Apple took away, first the floppy disk unit and then the CD and all the IT industry cried out how ridiculous they were, and how impossible it was living without them. At some point also, one guy in Menlo Park was shouting out how ridiculous and dangerous was using alternate current instead of DC (and took Tesla out of business). Examples we can have in excess, what I think is important about the main article is not whether the customer loves their gauges (we know they do, and some of us do love them as well) or not, but how that specific type of chart is not optimal (whether is nice or not, or how much the brass asks for them - either out of tradition or because they feel insecure when stepping out of their comfort zone) and how much space is used to create them. Even in the visualization link that I provided, it is needed another graph that actually conveys the exact information (when it is not possible with a gauge; i.e. : cars - our eternal example - we know with a gauge that we can go at 75MPH, over 75 or below 75 but we cannot know whether over is 75.5, 75.6 or 76; in order to do that we have introduced the digital speedometer). On the other hand, a gauge can tell if my status is green, yellow or red pretty well which can be done much more efficiently with a dot, a square or a bar. The discussion is not about how much we like or not the gauge, but how efficient it is to convey precise information when it is needed. Isn't true that sometimes the detailed information is irrelevant? When I drive over 75, let's say 76, I don't really are to know if I'm going 75.5., 75.6, etc. In fact I find that amount of detail annoying for the purpose at hand. In that line of thinking why not have the display go to even further decimal points. "You are now driving 75.5438576 miles/per hour." And I have to disagree with your last statement. The fact is that "precise information" isn't always needed or helpful. It's not always about precision - it's amount communicating the information that is essential effectively, and in a way that is visually pleasing. And with all due respect to Stephen Few, I personally think he vilified the pie chart without giving it credit for what it can and does convey. Everybody loves pie charts? So perhaps the question is why are they so visually appealing - and if I am in advertising and want to convince my audience of something rather quickly - might it be that the tool that is best to use is a pie chart??? Go ahead and analyze all you like about how the pie chart fails when you want to do a more in depth analysis. And for that purpose, sure, it is not the best tool. But perhaps the conclusion is not that pie charts are useless, but that they are only useful for conveying certain information in certain conditions. And to argue that people are simple minded and emotionally attached to pie graphs and gauges is a bit condescending and simply assumes the premise you are attempting to prove. Patricia you are completely right, precisely that is why it works perfectly in a car and it does not work in the same way when you are using the gauge to give precise information, that is what I have been saying all this time, gauges in visualizations are restricted by the type and amount of information they can give, hence the need of a better viz. I would find anyone that actually tries to go beyond the first decimal unit when using their speedometer on the far side of exaggerating. But if someone is using two to four decimals for an executive dashboard its pretty much OK, hence the suggestion of trying a method that can represent that information in way a better form than a segment of an arch. So, the issue at hand with gauges (and their bigger brothers the pies) is that visually (from a perceptive point of view) they are restricted in how the information can be presented where bars, tables and other types of graphs are not. Gauges are not evil, overusing is. I'm curious where you draw the line. Should we abandoned all best practices for the consumer who is always right? Break the axis on a bar chart, plot time backwards on a line chart, use red and green without regard to those with color vision deficiency, slice a pie chart into 50 slices, add some 3D and gradient colors, etc. Poor Stephen seems to be getting all the blame for the gauge and pie hate, but the reality is that most everyone in the data visualization community agrees on these things we call best practice. We have dialog with each other (hopefully in a productive and positive way) and we form our opinions based on experience, real-world application and research. Relating to your example above, I don't think I'm really advocating that we ban drip coffee if that's what people want to drink, but should we force DeLonghi or Jura to sell a drip coffee machine or force Starbucks to sell cheap drip coffee if they don't think that's how coffee should be made? It appears you are in the field of e-learning. Should we not strive to teach best practices and discourage not-so-best practices? Leave the drip coffee for Excel to create and let Tableau be the tool of choice for good coffee? As for my credentials, I have a MLIS in Library Science and information, a Master's in Education, and am completing my Masters in Applied Statistics. In my current work I do a great deal of data analysis and reporting for Administration and also review and design e-learning modules using adaptive learning models and data analysis dashboards for professors. I work everyday with helping professors review technology and encourage the use of best practices. However, in working with other professors, I make sure that I listen to what their needs are, what technology they are comfortable using, and use design principles that are most effective for their purpose. I have done a years of research in data analysis use in education, and have done lengthy analysis of the use of dashboards for assessing online learning. As for the coffee analysis, I'm certainly not arguing that we should force Tableau to do anything. Let Tableau do what it sees fit for its product. And if Tableau feels that Gauges or Pie graphs are not in their realm - than so be it. The things that I took issue with were 1) if you are going to make an argument against another type of graph, give each its due in terms taking time on its design, 2) if you don't want to include gauges in your design, provide a reasonable argument for it that avoids the use of false logic 3) define the purpose of your product - and make that the reason why you have left out Gauges rather than trying to argue that pie graphs and gauges have no place as graphs. As for "most people in the data visualization community" can you tell me what is meant by that? And what it is that they are exactly saying are best practices. I personally think its foolish to say that gauges and pie charts have no place in data visualization. I'm in the field of e-learning, but I'm also in the field of data analysis and data visualization. I'm all for letting Tableau be the "tool of choice for good coffee" if by this you mean a coffee that specializes in detailed visual analysis. My problem comes in when people begin to stick their noses up at simpler graphs that still have their place in communicating data. Over and over again I hear people on the anti-gauge and the anti-pie graph bandwagon. And I'm not so sure it's as simple as saying that Excel provides only drip coffee. I personally like Tableau - but have also been at Big Data Conference where other data analysis companies have spoken poorly of the analytic capabilities of Tableau. In many circles if you can't code R, you ain't nothing. At perhaps they have a point, in terms of their specialty One person's single shot of espresso is simply the foundation of another person's Mocha. But then again, perhaps it's being used for an Americano. When I reference "the data visualization community" I was referring to people who practice and teach in this area. I teach data visualization at the University of Cincinnati, at KPMG advisory university as well as workshops at other companies and universities. My use of "most people" is referencing the vast majority of the experts in the field. Besides Stephen Few there are probably a hundred or more that I could list and in my dealings with them, I am fairly confident that they would come to general consensus on best practice regarding most of the issues we are discussing. However, one common term you will hear often is "it depends". There are always exceptions. There's always a give and take with visualizing data. If you stack a bar, then you give up something by doing so. As an example, it is generally accepted that using a pie chart on a map is an acceptable use (even Steve would agree with this and in part why Tableau offers them). This is because there is no great alternative for showing a part-to-whole relationship on a map (no common baseline). A pie chart with 2 slices, say 75% and 25%, is certainly better than 25 slices that can't be easily compared. So if I caveat an instance of static data, that we are sure isn't going to change, where there's not going to be more slices added later and where the data can be clearly displayed, then sure a pie chart might work, but other options can work too and will work without those caveats. A bar chart is typically a great chart choice, certainly a best practice chart type, but if you plot unemployment rate by state then 50 bars will be overwhelming to a reader and there's likely a better way to visualize that, for example a map. So I agree, it does depend on the situation. The gauge is a bit different. The issues with pies and donuts, and many other issues in DV, have to do with visual perception and the pre-attentive attributes. The gauge chart doesn't suffer comparing slices by angle or arc, but it does have some other common issues. For example, in a donut or gauge the visualization has an upper bound. That's often 100%, a full donut or a maxed out gauge. The bullet chart or bar with target doesn't have this limitation. So if a business unit knocks it out of the park then it can handle 200% or 300% of goal without a redesign. The gauge can be adjusted to handle this, but it would be wasted space if adding a 500% just to be safe and could easily "break" if not designed right. Another issue, also in common with pies and donuts, is that comparisons can be very difficult and starts to take up viz real estate very quickly. Comparing 20 products in 4 different product lines across 4 regions would require the use of gauges as small multiples. Using bullets or bars with a target line, it would be easy to compare and rank in a variety of ways to see all kinds of interesting things in the data. And to one of your examples, a single gauge that has a simple design and two values likely gets the message across to the executive [waiting to be struck by lightning]. On our executive dashboard we have 5 groups, each has a sparkline for historical data and a bar chart with target line for month-to-date. Another issue is that because gauges and donuts are designed to show numbers as a % of whole they don’t allow for a comparison of absolute values. Here is an example of a 3 gauges showing performance. In this example, the web direct knocked it out of the park, but it’s not clear to the reader that this is only $487k in scale compared to the South and East which are over $10M each and both missed target. We have an $8.6M miss from goal in this case, but that message is completely hidden in this visual. It also takes a good bit of mental math to even get to the answer. In this case, three bars on the same scale with a target line would give a much better picture of how bad it truly is. These are just a few examples that I hope are helpful. how can i use Gauge Charts in tableau? "In data visualization, gauges simply solve the wrong problem. Business decisions cannot be made only on the current value of some measure, but need history and context. Values also typically do not change as fast, nor are as directly coupled, as the amount of pressure on the accelerator and the car’s speed." When I first learned to fly, in small single-engined aircraft, the instruments were all gauges of one sort or another, especially the crucial ones, like airspeed, altitude, vertical speed, and tachometer. When I got my first assignment our of Air Force pilot training, it was to fly four-engine jets, far more capable craft and most relevant to this discussion far more complex. The prior generation's aircraft, even large complex ones, still used gauges. They were (and are) visual nightmares. Multiple gauges for each engine - times four. One learned them, but it required more visual time looking at and interpreting them to absorb and process the necessary information. And that critical time was not being spent absorbing and interpreting other information - like where the hell are we? Thus, I was thrilled to be assigned to fly four-engine jets that primarily used an early equivalent of a simple bullet graph. They were simple white vertical stripes. Each type of information, for example exhaust gas temperature, fit in just one instrument and each engine was represented by one vertical white stripe - arranged left to right, in accordance with the position on the aircraft. So, for example, if one engine was running hot, one saw, interpreted, and absorbed the difference practically instantly. Loud bang? A quick glance would likely tell you where the problem was. Here's the thing. This was over 40 years ago! There's been plenty of time for flight instrumentation to be further improved and for it to contribute to improved safety and performance - which it has. And there's been plenty of time for improved instrumentation to contribute to improved performance in other sectors as well. I, for one, admire Tableau for resisting the siren call of "the customer is always right." Rather than spend its time and resources on reviving an out-of-date technology, it can and should spend its time and energy on further improvements. And this is not just a matter of principle. All else being equal, their customers will be the ones more likely to survive in a complex and fluid environment. It's great that we now have some solid argumentation here on why gauges are not a match with the kind of complex data visualization which Tableau provides. Now a gauge would be pretty good at showing a binary chart where we can have a two colour-coded message: "Sarcastic" and "Not Sarcastic", isn't that awesome? Hi Edmundo, I am surprised you would think I was being sarcastic. I have no emotional attachment to the discussion. I was simply trying to point out that the original post was lacking in its argument about the usage of gauges. I believe a balanced approach in discussing these matters is important. I very much appreciate the time that people took to present evidence in favor of going past the use of gauges in data analysis. It takes time and consideration for people to post thoughtful and well detailed posts. I personally do not look at the discussion as a win/lose proposition. Rather a discussion and meeting of minds on an important topic. Oh, and by the way, I absolutely love the gauge design you referred to in an earlier post. Honestly I think that particular gauge is quite visually pleasing and effective for its purpose. Dare I say that in is in my opinion a better visual representation than the bullet graph that follows it... Simple and to the point works for conveying simple information. And pleasing to the eye. Love it. I found a viable alternative to gauges in Tableau! I totally agree with Gordon Atkin. Gauges are definitely not the best practice but there are many places they are very useful and many users love them. Many customers still want gauges and are visibly disappointed when they hear that Tableau does not have them. It does not matter how much you try to justify the absence, not having the option to use gauges is a weakness of Tableau for many out there. The most interesting part of all this is that, as far as I have read all the conversation (and all the participations) there are no "haters" here, there are people who think that there is a better way of displaying information and data other than using a gauge and also, given all the reasons here, why we do prefer not using them instead of bashing Tableau or users. Justifying one's position by calling others "haters" is not how our community has grown and not how I perceive this thread was going, but obviously (from the last post from Gauge Lover) is easier to hate than to just propose and create a "Yes" situation instead of "How nots"
May I point out that it was you who refereed to both "gauge lovers" and "gauge hate". See your link to Dueling Data, I'm not coming up with these labels... you did. Thus the article. Oh, and by the way... "justifying my position." Just what is my position in this argument? Here is my whole point, Edmundo. I have no position on gauges, and never did. I absolutely have no stake in the matter. I'm sorry, but I found the way you approached the conversation a bit offensive. And perhaps some of your customers do to. Funny thing is that I absolutely love Tableau - and thus I didn't mention the name of the company in my article. The truth is it seems to be that some of your posts came off as condescending. As for winning and argument... I'm not representing any side... and that's the very exact point I'm trying to show you. I have no "hate" at all. I was simply trying to make the point that some people in Tableau are taking this way too far. I was planning on using Tableau in my classroom, and now I'm not so sure. You now appear to have irritated at least one future customer in the way you are presenting your argument. And for you, Edmundo that should be an issue you care about. I feel that (now that you are addressing me directly) that you do not like to not have TEH reason and you think you are a "rebel" and that is OK if you do not take things personal. A discussion is just that. The fact that just because you found a single person (out of the thousands that use Tableau) "offensive" makes you "not so sure of using Tableau in your classroom" actually makes a lot more for how you see the world. Just go ahead, and do what you think suits you better, just like everyone else here and outside. Some of us use the now infamous gauges at some point, and even better! Many have found how to produce them using this awesome tool!!! Go figure!!! Be careful when you give feedback as well, specially when such feedback (as a professional I thought you knew better) has not been requested nor opened for. Live in peace and love what you do. For some reason I thought you worked for Tableau, and as such I took issue with your line of reasoning. Now realizing you are not an employee of Tableau, I retract those comments. As a professional, I do believe that people should be able to have conversations online about these types of issues. In fact I learned a great deal from several of the intelligent posts on this thread. I'm not embarrassed by anything I have said here. I am sorry you are taking things so personally. My article on "Gauge Haters" was simply meant to be playful and nothing more. And while it is true that I found many of your comments condescending, it really doesn't matter to me, now that I realize that you don't actually work for Tableau. The fact is that I am really happy to have explored the limitations of gauges, and it has helped me understand why Tableau may be choosing not to include them in their software. I am very much in favor of open conversation and communities of learning. And as such, I am happy to have participated in this thread. I believe it is through the willingness of people to be involved in this conversation that learning takes place. And thus I say thank you to those who did participate and helped enlighten the topic for me and for others. Dear Patricia, again as you said before: "you took issue with my line of reasoning" just because you "thought" I was an employee of Tableau. That is personal. When you address the comments directly to me... well there is no other choice than to take them personal. Regardless of what your article wanted to be "playful" or not, is irrelevant, because you are making a very biased, personal and subjective distinction between an employee and a fellow user, that is never a nice way of engaging in a conversation. Last but not least: it is awesome that now you are happy because of what you found here, and I hope that remains your state and of all the people we find in our paths. As one sage said once: "If you think positive about other people's intentions you may find that most of the time you are right"
It seems there is some misunderstanding here. I apologize for anything I may have said that offended you. My intentions were simply to discuss with others why or why not people view gauges as effective. Please feel free to contact me via my Linkedin account. Perhaps, then, we could discuss this over the phone as I feel there is much being misunderstood here and I am sorry if I upset you. I will send you my Linkedin request so we can keep building a cool and professional growth relationship; passionate people with the right objective in mind, are the ones that can make changes and make this world a better place to live in. Hope to see you at the Las Vegas event this year. Just wanted to chime in and thank Patricia for challenging the argument from this post against gauges. I had to laugh a bit when I saw that the gauge was bereft of any stage coloring--give the poor gauge a fighting chance! For those asking for evidence rather than opinion, I'll point you back to the article, and the 30 year old research by Cleveland that demonstrated that humans perceive and compare length much more accurately than angle. Gauges are not ubiquitous because they're good, they're ubiquitous because they were a manufacturing necessity 100+ years ago, when we had no better mechanical alternatives for showing pressure, speed, etc. That's hardly a justification for using them now that we have alternatives in assorted contexts. Love the bullet graph, will try to start incorporating that.